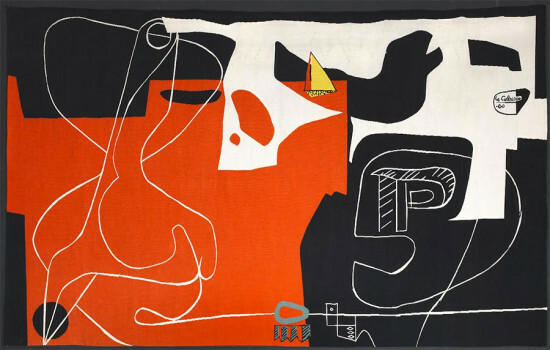 For 2 weeks, two exhibitions in NY about Corbusier overlapped. 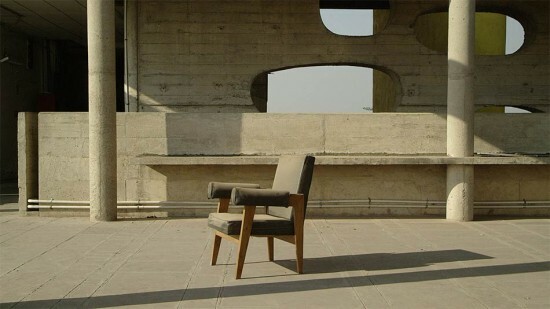 In addition to the MoMA retrospective that closed on September 23, Amie Siegel’s Provenance at the Simon Preston Gallery on the LES (through October 6) examines a rather different slice: from the point of view of the furniture created for Chandigarh, the Indian planned city of the 1950s. The film that forms the core of this installation travels in reverse, de- and re-contexualizing the objects. It starts with Chandigarh chairs, settees, and tables in their new homes in the West from apartments to lofts to townhouses and even yachts seen in slow tracking shots and lockoffs by cinematographer Christine A. Maier. These are perfectly crafted interiors that are pristine, light, airy, signaling the curated good life as seen in Architectural Digest. Peeking out are the inventory numbers, like a Holocaust tattoo or cattle branding. Does it give the furniture a limited-edition cache? The pieces are like adopted children who have been lucky enough to be given a new life, but they are out of their native culture and are isolated from their tribe. Even in their new surroundings with other treasures, one can always pick out the Corbusier piece, with the sharply angled forms—triangles are a distinct feature—and geometric planes, even in their new clothes of reupholstered checks, squares and luxury leather. Questions about preservation, neglect, restoration, reinterpretation, and fetishism arise. We then peel back to a photography shoot for an auction catalogue that isolates the furniture in a neutral white space and shows off its best side. We visit the auctions which fetch high prices: $60,000 for a pair of armchairs, and a manhole cover for $24,000. The settees, floor lamps and desk chairs look perfectly at home in the Paris Beaux Arts auction house Artcurial in the 1844 Hôtel Marcel Dassault off the Champs-Élysées. Dialing back further, we see damaged, frayed, ripped furniture waiting to be restored. Like a patient, an armless black settee is carried to the `operating theater’ where it is gently stripped of its leather upholstery and padding, and taken down to its wooden bones. Container ships have brought over this furniture, piled high, like refugees in steerage. Winding back the clock to the city of Chandigarh is a site to behold. A vision from afar, as we get closer the city’s architecture is revealed to be weathered, rusted, and sad, an elegant but faded dowager. Think Miss Havisham in Great Expectations. Monkeys climb with abandon, mildew blackens the concrete. Inside, bundles upon bundles of paper are crammed into cubbyholes amidst tangles of computer wires on metal shelves as well as the original wooden units and desks. Stacks of disused, cobwebbed original furniture are everywhere -- outside and inside. The complex has been modified: satellite dishes on the roof, pre-fab office dividers creating cubicles, turquoise office chairs on wheels, metal filing cabinets, dropped ceiling with fluorescent lights, space-saver storage systems in addition to the original furniture models we’ve seen in Western luxury homes at the beginning. Although the General Assembly and Library are more intact, the furniture is largely unloved. Have generations of users modified the work as they needed? Nehru, who commissioned Corbusier to create Chandigarh, said the new metropolis was to be of a design "unfettered by the traditions of the past, a symbol of the nation's faith in the future," and the team designed everything from the vast sculptures outside to the door handles within. (Much of the furniture was created with his cousin, Pierre Jeanneret, and not Charlotte Perriand.) Many of the items for sale in the U.S. and Europe came from stock "condemned" as unfit for use by the local administration and sold off at auction to dealers, often unaware of their value. Protests have been unheeded. It’s a complicated question. 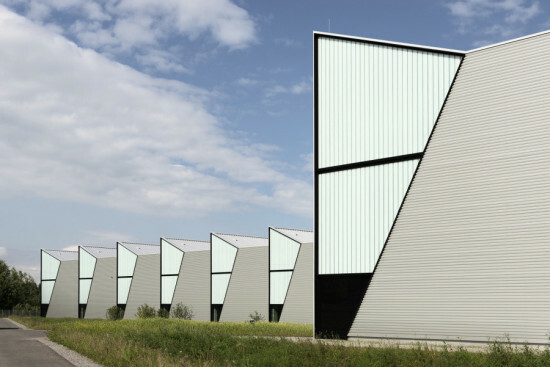 One is reminded of Corbusier’s declaration: “Space and light and order. Those are the things that men need just as much as they need bread or a place to sleep.” At the back of the gallery is a second filmed installation of a 360-degree loop of the Chandigarh’s Natural History Museum cyclorama “Evolution of Life, "furthering what Siegel calls the “economy of objects." 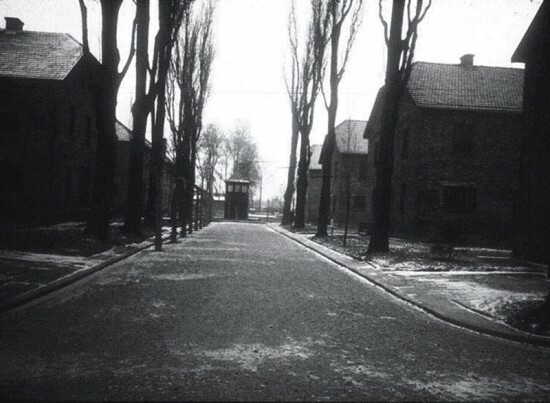 Siegel’s photographs, sound, video and film installations have long focused on architecture and ideology. Black Moon, 2010, is set in the post-apocalyptic landscape of foreclosed housing developments in Florida and California. The Sleepers, 1999, features the architecture of city windows at night, lives glimpsed at a distance. Berlin Remake, 2005 and DDR/DDR, 2008, both deal with East German architecture, representation and surveillance, while Deathstar tracks down early German modernist buildings of the Third Reich including Templehof Airport. 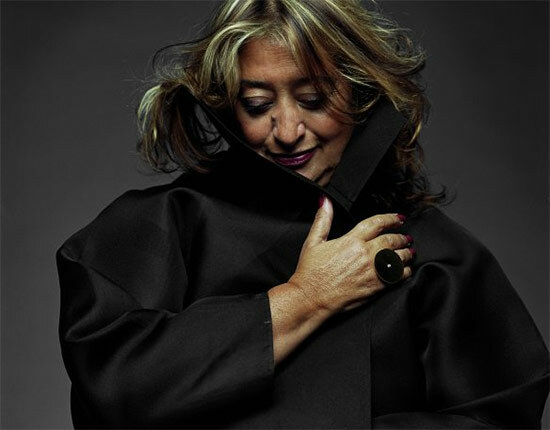 And she is currently in two other exhibitions, City of Disappearances at CCA in San Francisco and Mad, Bad and Sad at the Freud Museum in London. Provenance has one more stop. On October 18 and 19, the film itself will be auctioned at Christie’s in London in the Post-War & Contemporary art sale. That event will be filmed, too, and become part of this project. 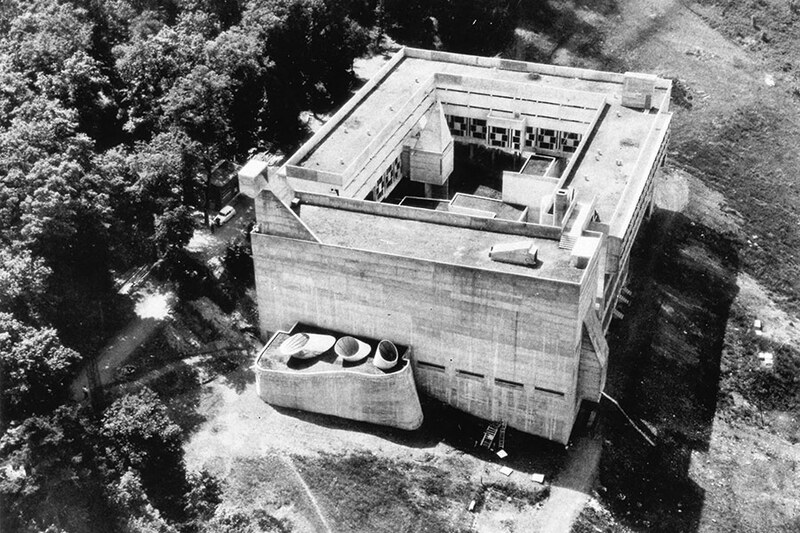 This year marks the 50th anniversary of the construction of the Carpenter Center for the Visual Arts. 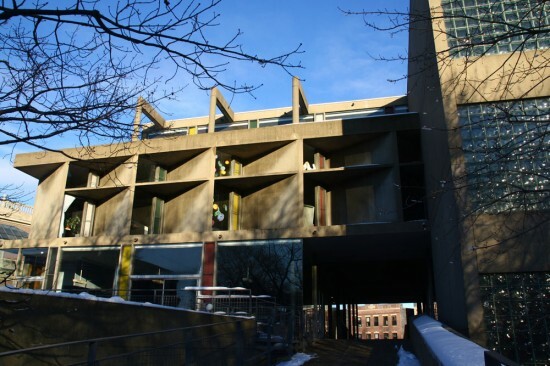 Completed in 1963, it is Le Corbusier’s only major building in the United States, and one of his final commissions before his death in 1965. The renowned modernist architect envisaged a "synthesis of the arts," the union of architecture with sculpture, painting, and other arts. In the spirit of Corbusier’s unique style, the building stands out among the more traditional architectural prototypes of the Harvard campus. 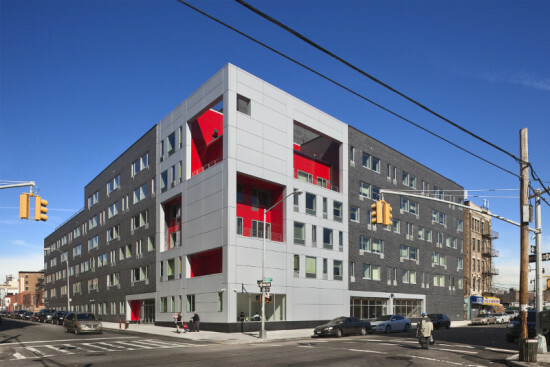 This is evident right from his initial concept sketch of the building, where Corbusier utilized bold colors to denote the new building, while shading the surrounding Harvard campus in dark brown—a color not typically part of his visual palette. The Center is unmistakably Corbusier, and reminiscent of the Villa Savoye with its smooth concrete finish, thin columns which break up the interior spaces, and a great curvilinear ramp which runs through the heart of the building, encouraging public circulation while providing views into the design studios. This achieves visibility and transparency of the creative process taking place within. To mark the anniversary of the buildings completion, Harvard displayed new material that revealed the evolution of this unique five-story structure. While Le Corbusier was never able to see his preliminary sketches come to fruition, the Carpenter Center for the Arts successfully unites a range of art disciplines, and continues to maintain the largest 35mm film collection in the New England region, as well as housing Harvard’s historic film archives. 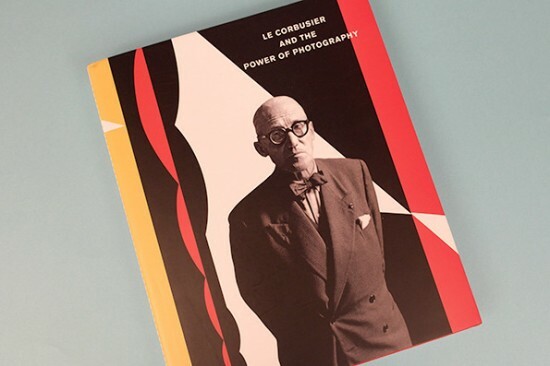 Though books typically fall outside the scope of what we consider to be architectural products, we're making an exception for Thames & Hudson's new publication, Le Corbusier and the Power of Photography. Those familiar with Corbu's much photographed architectural work may not know that he was something of a shutterbug himself. According to the publisher, he not only "harnessed the power of the photographic image to define and disseminate his persona, his ideas and buildings," but his influence on the medium led to the rise of photography in general. From another perspective the book provides a more intimate way to access Le Corbusier's creative process and some of the surprising inspirations behind his work, including images of him in his preferred office attire—his birthday suit. Images courtesy of It's Nice That. 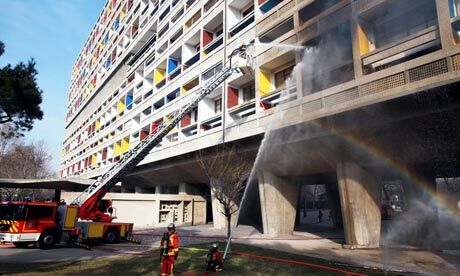 The Guardian is reporting that one of Le Corbusier's most famous works, the Unité d'Habitation in Marseille, France, has been damaged in a fire. Three apartments were gutted and many other units were damaged by the fire, which took 12 hours to contain. Five people were being treated for injuries. Originally built as low-income housing between 1947 and 1951, the Unité is now a protected landmark in France and home to approximately 1600 residents in 334 apartments. Rem Koolhaas has been thinking about the United Nations since his early Delirious New York days. Earlier this century, he even made a bid to design a new Secretariat. 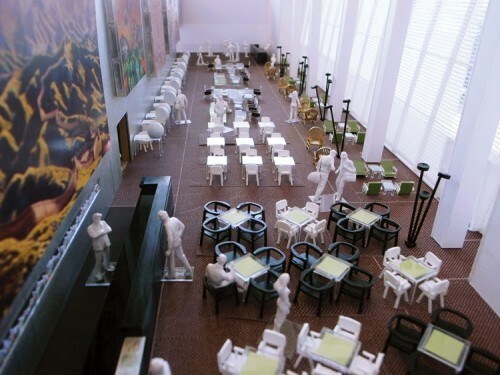 While that project didn’t pan out, the Dutch architect is joining a team of countrymen and women to “reconceive” the North Delegates Lounge in the Conference Building. In addition to OMA, the team will include designer Hella Jongerius, graphic designer Irma Boom, artist Gabriel Lester, and “theorist Louise Schouwenberg.” Occupied since 1952, the original space is sandwiched between the Secretariat and General Assembly; it is a magisterial double-height room hundreds of feet long with floor-to-ceiling windows overlooking the East River. A swank bar at one end was replaced in 1978 with a mezzanine and smaller bar that will be removed to take advantage, once again, of the room’s corner views. Keenly aware of the complex’s complex identity and Le Corbusier’s grab for design credit, Koolhaas who once wrote that the U.N. was a building that “an American could never have thought and a European could never have built” has described the team’s approach as the “preservation of change.” The renovation will include handmade bead curtains, new carpets, a combination of original Knoll club and Eames lounge chairs with new furnishings, and a new installation for artworks donated by member states. The fate of a 300-foot tapestry of the Great Wall of China (50,000 yards of wool; 600 pounds) that once hung in the lounge and was donated during the ping-pong détente of the 70s was not mentioned in the press release. 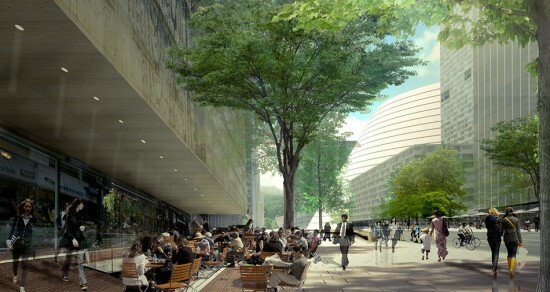 The project sponsored by the Dutch Ministry of Foreign Affairs is scheduled for completion in 2012.